ARCHWAY Allstars will kick off the new season in the Camden Sunday League after beating treble winners Reddot to book their place in the final of the President’s Cup. And it looked like business as usual when Liam Barnabie fired the Dots in front within the opening minutes of the match. But Archway hit back to take a 3-1 lead thanks to goals from George Carroll, James Birney and Danny Keohane. Reddot pulled a goal back through John Donovan to set up a nervous finale, but in the end Archway held out to secure a thrilling 3-2 victory. The Allstars will now face Division Two champions CS Maritimo in the season curtain-raiser, which will take place in September. Despite a final day defeat, Reddot will reflect upon a magnificent campaign, which saw them win the Division One title, our Camden New Journal Challenge Cup and the Senior Cup. 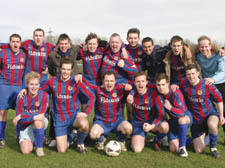 Elsewhere AFC Shooters were crowned champions in Division Three, while the Constitution captured the Junior Cup.